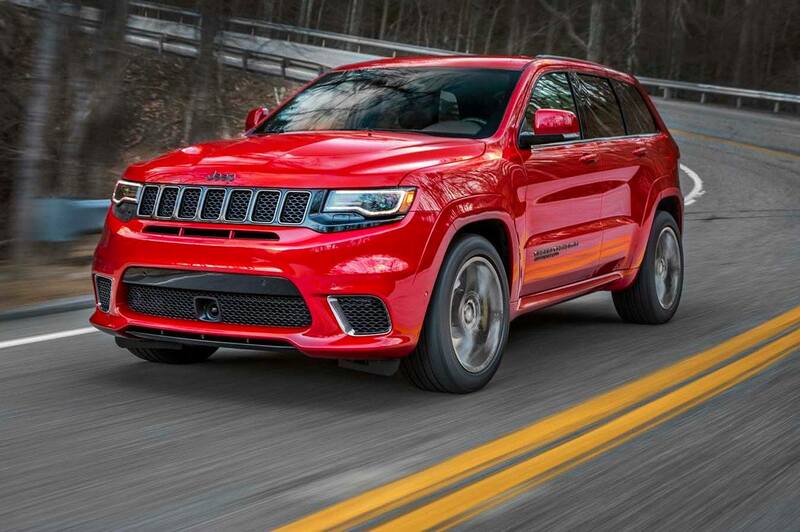 After a very long wait, the 2018 Jeep Grand Cherokee SRT Trackhawk is finally here. 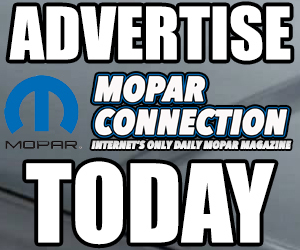 Many thought the day would never come. 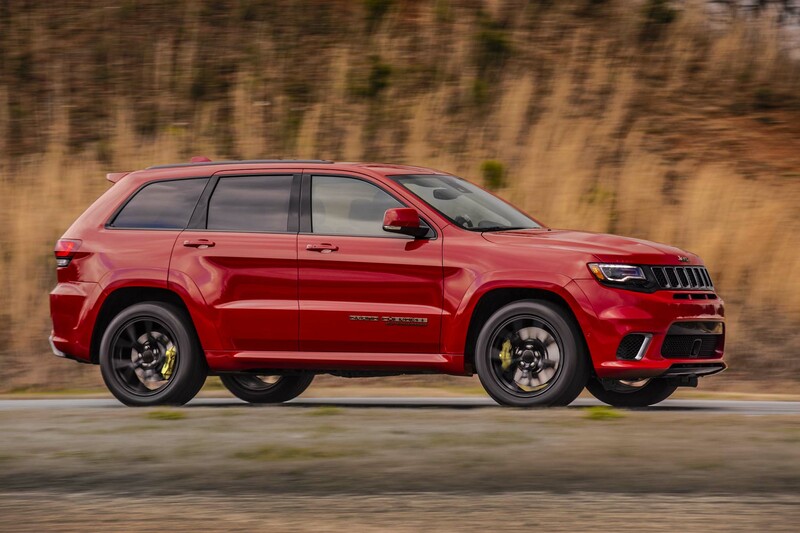 Jeep kept this one pretty “hush hush” with only the occasional spy shot and video coming out of the woodwork during the design, test and build period; leaving many to wonder if it would actually ever seen the light of day. With the results of their hard work finally revealed, we must say we are quite impressed! 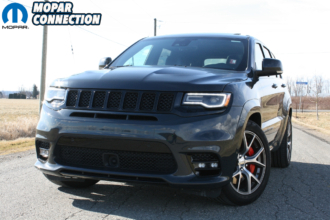 Powered by SRT’s legendary Hellcat 6.2L Supercharged HEMI engine producing 707 horsepower, 645 lb.-ft. of torque and 11.6psi of boost pressure, Jeep estimates it will do 0-60 mph in 3.5 seconds, a top speed of 180 mph and run the quarter mile in 11.6 seconds at 116 mph. 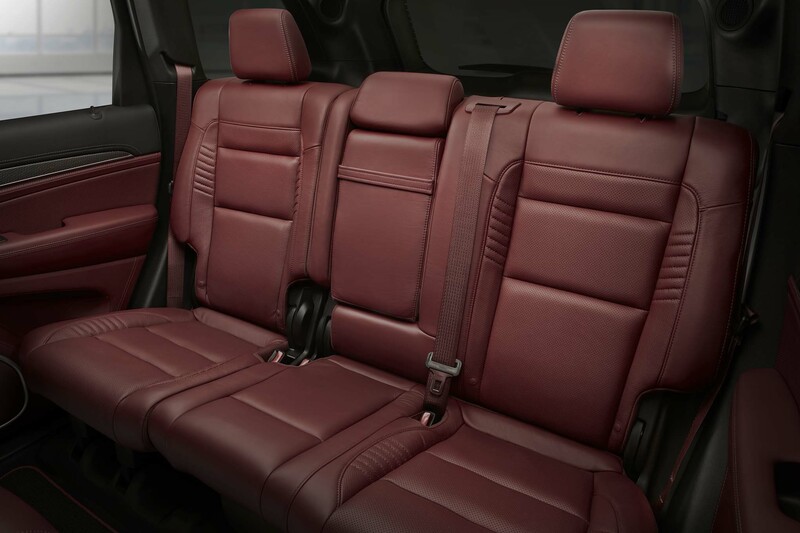 That’s not too shabby at all for such a big SUV weighing in at 5,350 lbs! 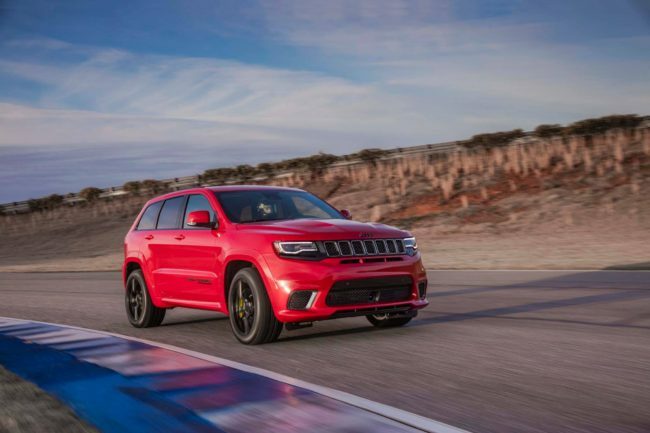 From a technical standpoint, the Hellcat HEMI in the Trackhawk is more or less the same as the one in the Charger and Challenger Hellcat models. 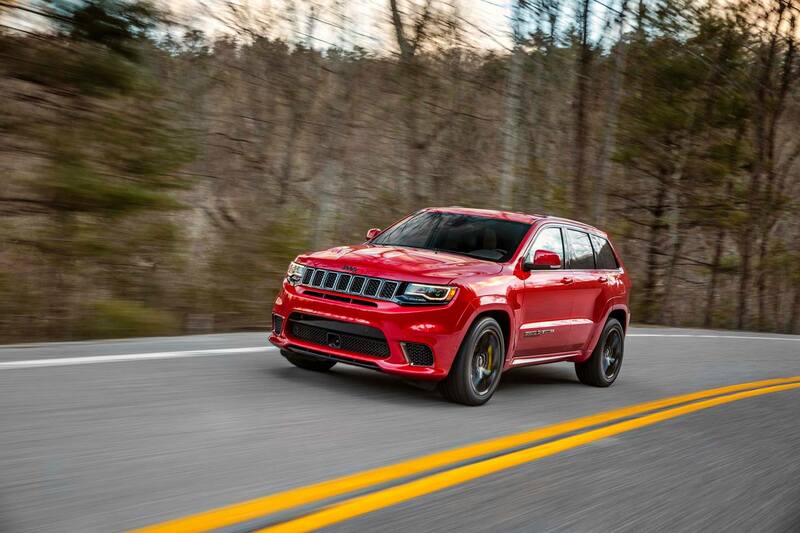 The only major difference for the Trackhawk is the oil capacity was increased from 7.0 quarts to 8.3 to help with lubrication during towing and other heavier uses. 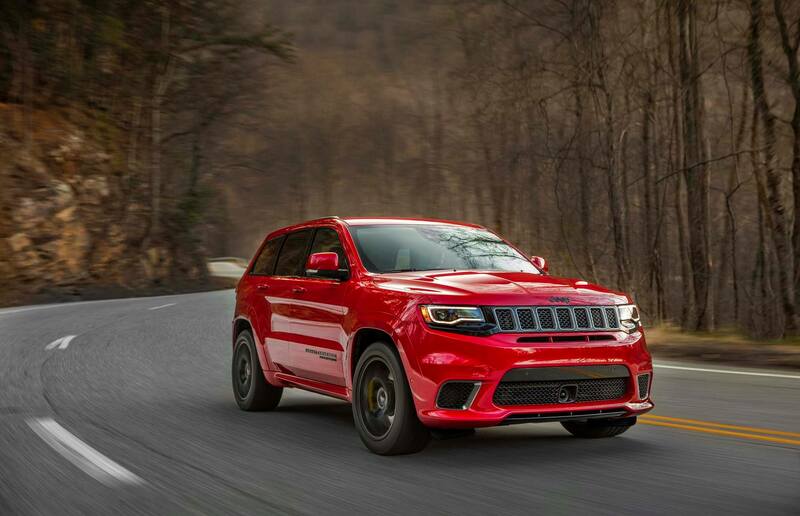 After all, you will be able to tow 7,200 lbs with the Trackhawk; just like its SRT sibling. 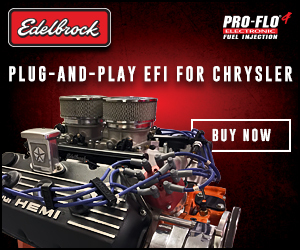 The HEMI is backed by FCA’s trademark TorqueFlite eight-speed automatic transmission for performance drivability and optimized fuel economy. 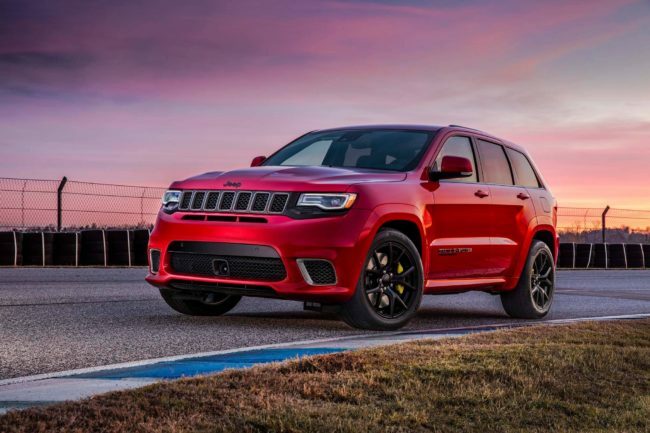 The transmission shares the same gear ratios as the Hellcats but everything else was beefed up and calibrated for the Trackhawk to accompany the AWD system and of course, the previously mentioned towing capabilities. 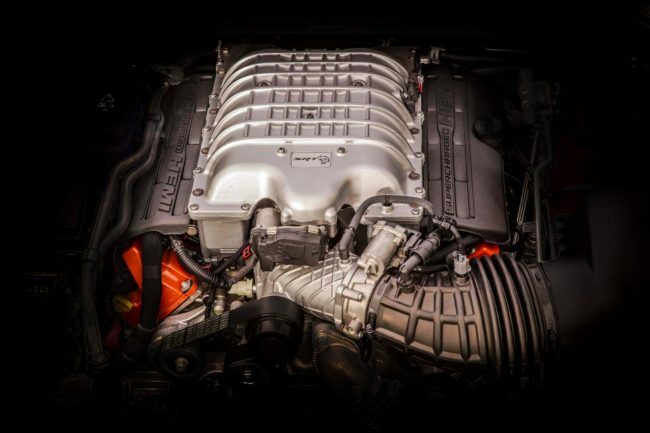 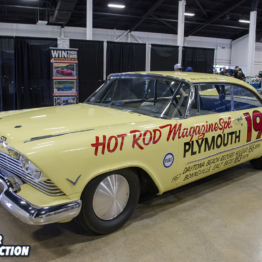 Therefore, the transmission was given a new model name; the “8HP95”, versus the “8HP90” in the Hellcats. 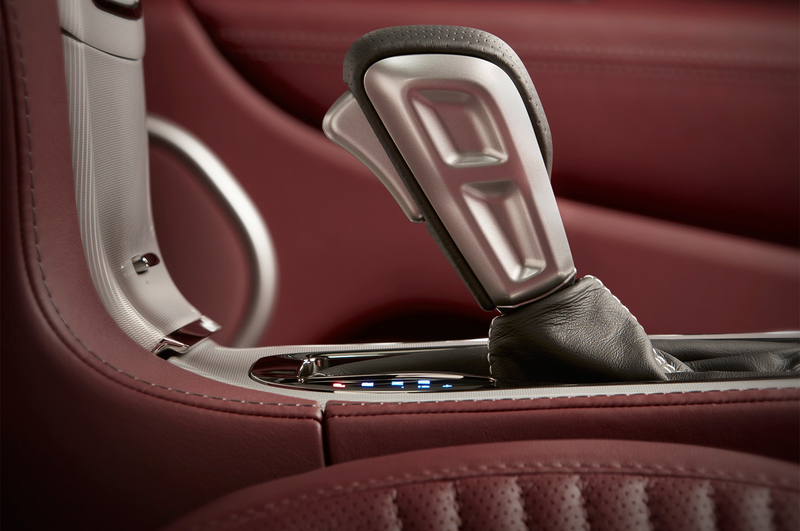 For the ultimate driver experience, the transmission can be manually shifted using steering wheel paddle shifters. Jeep says the half-second shift time is cut down to a quarter-second in Sport mode and cut down even more to a mind blowing 160 milliseconds when placed in Track mode. 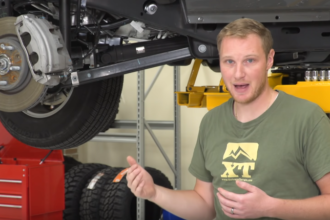 The transmission bolts up to a Quadra-Trac MP 3015C single-speed transfer case that is fully capable of varying the front to rear torque split from 60/40 percent in trailer-towing mode to 30/70 in Track mode and then 50/50 in Snow mode and 40/60 in Automatic mode. 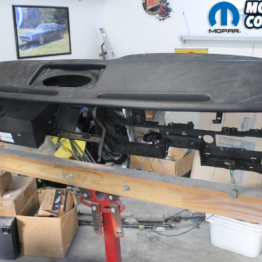 To add extra toughness to the transfer case, forged chain sprockets and a wider chain were employed. 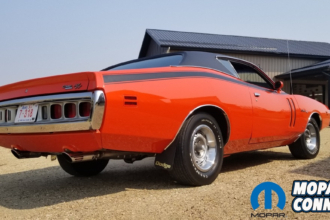 Putting all that power to the ground is done with the use of an electronic limited-slip differential fitted with 3.70:1 gears versus 2.62:1 in the Hellcats. 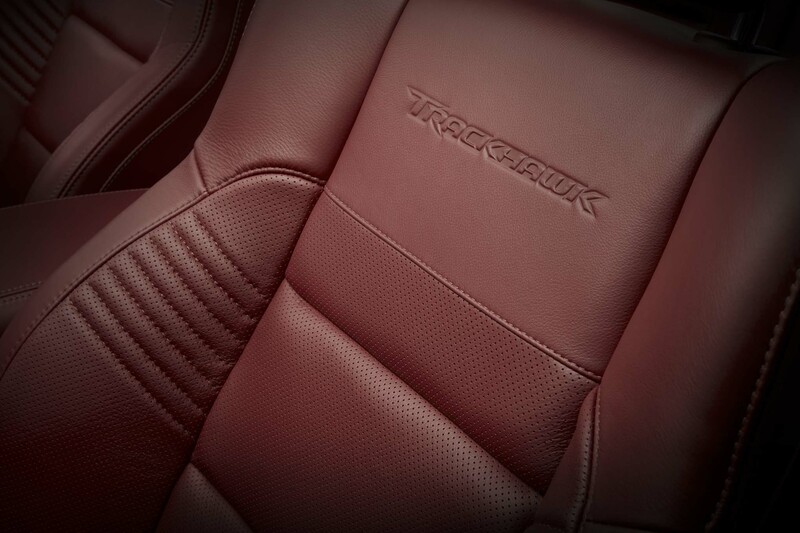 The Trackhawk’s half shafts are made of ultra-high-strength 300M alloy vacuum-melted steel, leaving you feeling comfortable that you won’t snap anything with a hard launch while using the Trackhawk’s “Launch Control” feature. 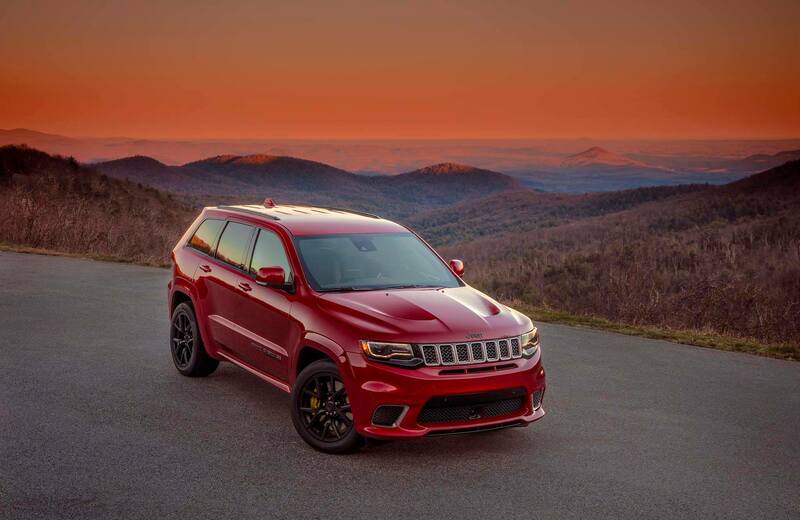 The Grand Cherokee SRT Trackhawk delivers excellent braking performance thanks to massive Brembo high-performance six-piston (front) and four-piston (rear) calipers coupled with vented rotors at all four corners measuring 15.75 inches in the front and 13.78 inches in the rear. 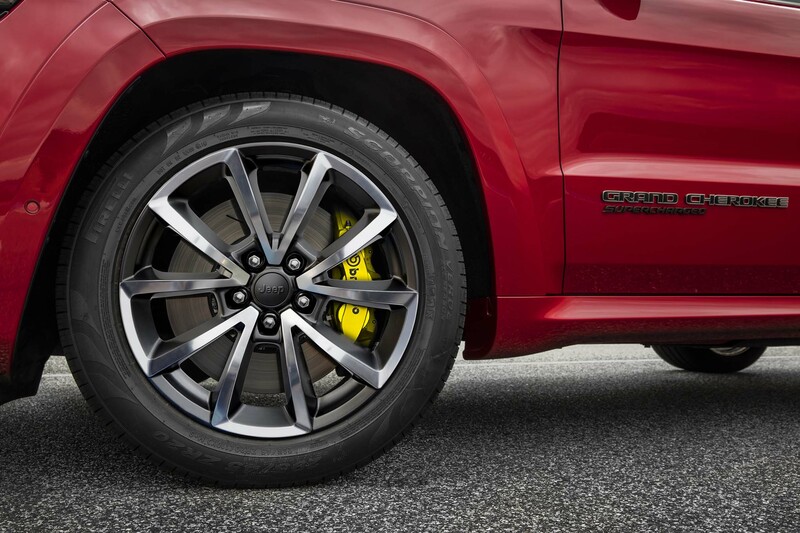 These are the biggest brakes ever offered on a SRT model and for the first time in SRT history, the Brembo calipers feature a bright yellow finish! 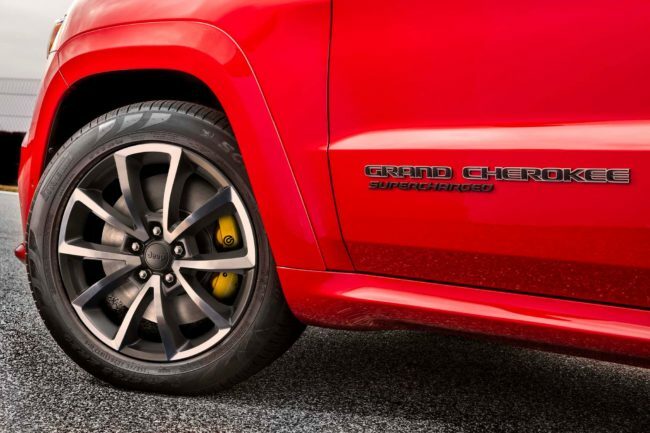 Jeep says with this braking system, 60-0 mph braking is done in just 114 feet. 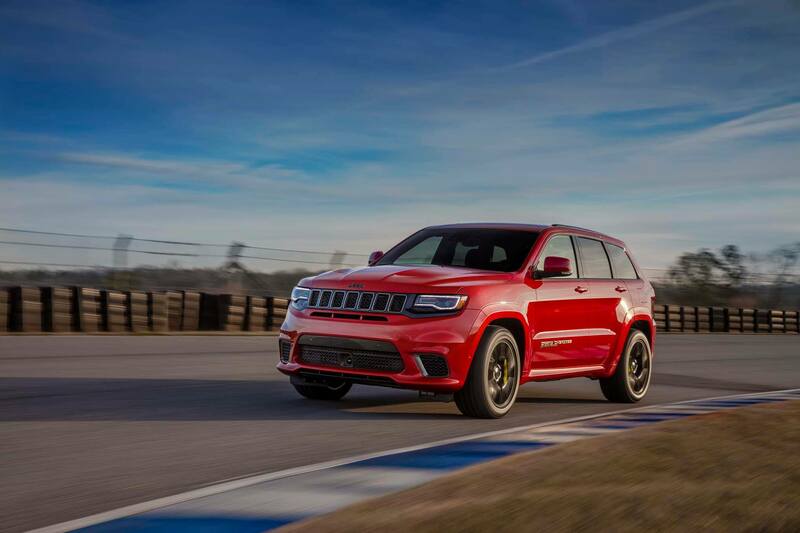 When comparing the Trackhawk to the SRT, the engineers have stiffened the front springs by 9 percent and the rears by 15 percent, and changes were also made to the specially tuned electronically adjustable Bilstein dampers. 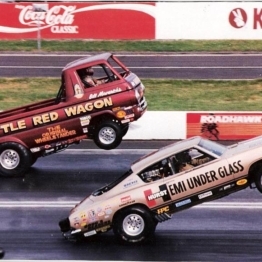 The only other chassis changes are wider front and rear tracks (by 1.3 inches and 0.1 inch). The Trackhawk rides on 20×10 inch cast aluminum wheels that come standard with a titanium finish. 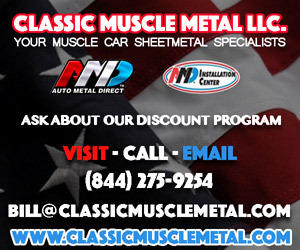 The upgraded option available is a forged aluminum choice that is finished in a low-gloss black and each weight 12 pounds less! 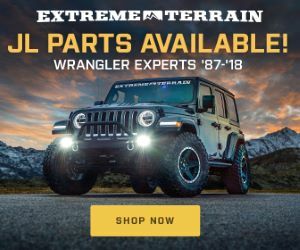 Standard tires are the Pirelli 295/45ZR20 Scorpion Verde all-seasons and like the SRT Durango, Pirelli P Zero three-season tires will be available as well. Inside the cockpit, you will find a hand-wrapped leather dashboard, a brand new steering wheel featuring the Trackhawk logo on the bottom and a beautiful combination of carbon fibre and brushed aluminum accents. 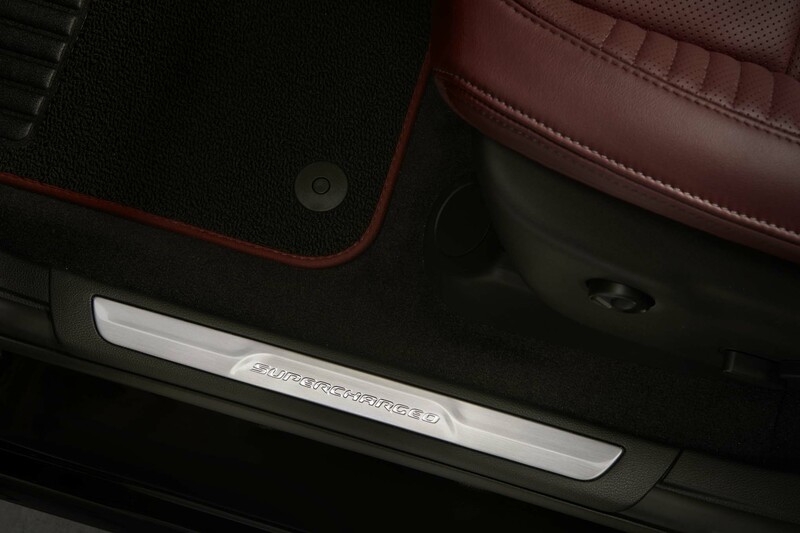 Striking brushed aluminum door sill plates that say “Supercharged” greet you on your entry. 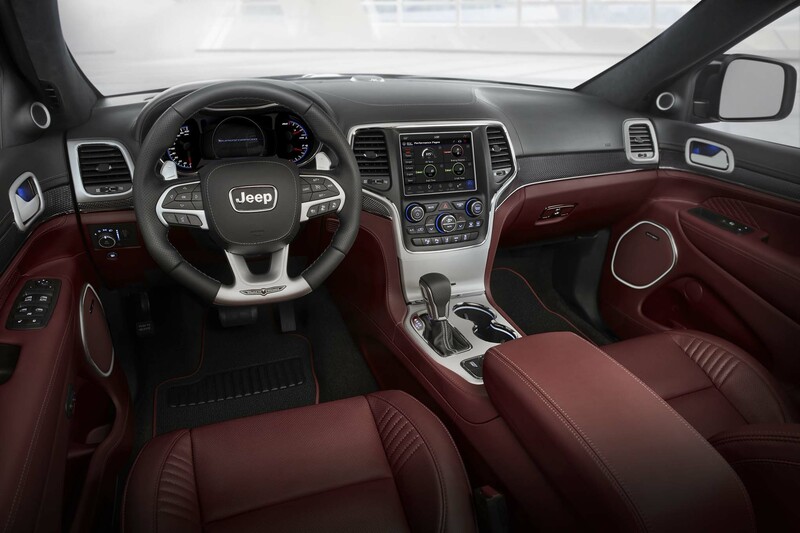 The rest of the interior is identical to that used in the SRT version with the exception of the Trackhawk logo embossed into the front seat backs. 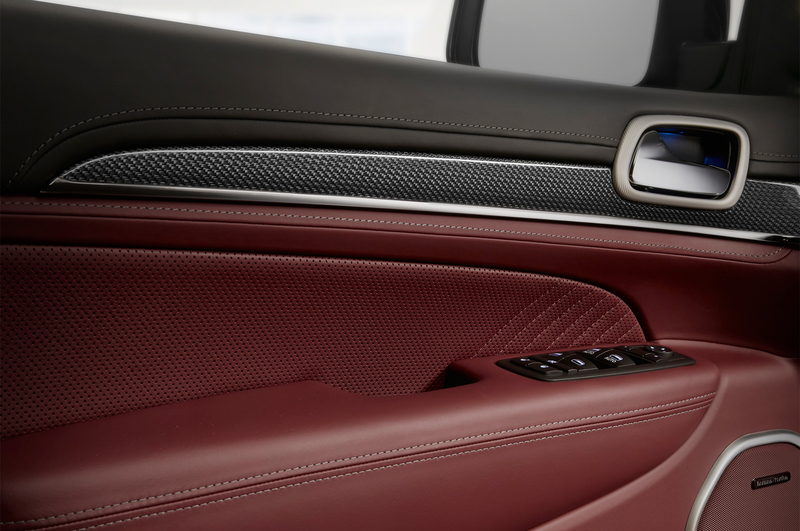 Colors for the interior haven’t been announced yet but we will assume they will be similar to that of the SRT; black, Ruby red and Sepia brown. 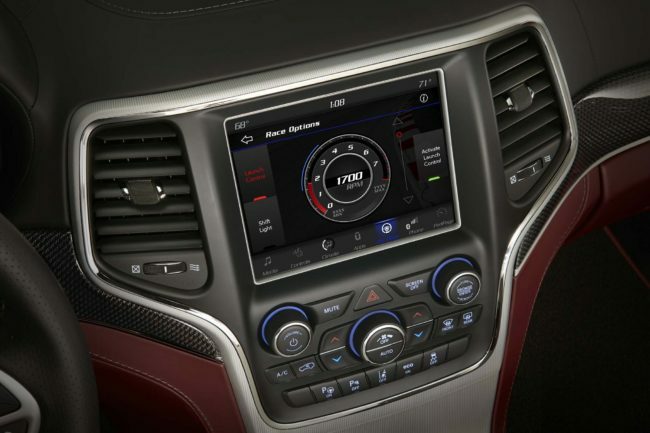 Standard gear in the Trackhawk is the 8.4-inch Uconnect touchscreen, which features Apple CarPlay and Android Auto. 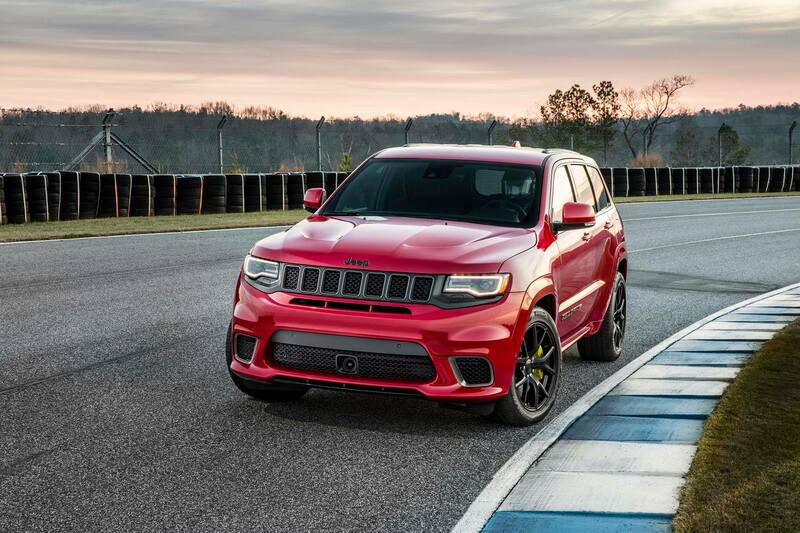 It also features exclusive Trackhawk Performance Pages to monitor and record various performance parameters which should come quite in handy at the track. 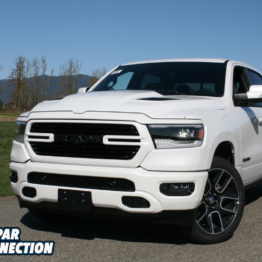 Those that plan to tow something will be pleased to know that it also offers a trailer hitch camera view that lets the driver keep an eye on their trailer while driving. Like the Hellcats, there will also be a Valet mode that limits horsepower, torque and max engine speed. 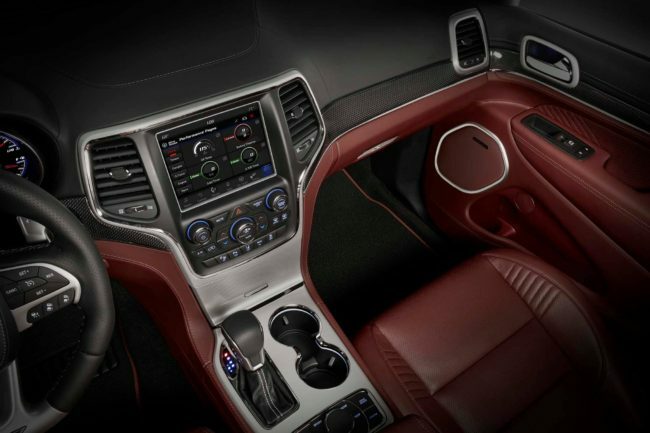 It also locks out the transmission’s first gear, disables manual mode and paddle shifters, reverts to Street settings, puts ESC on full-on mode, and disables launch control. 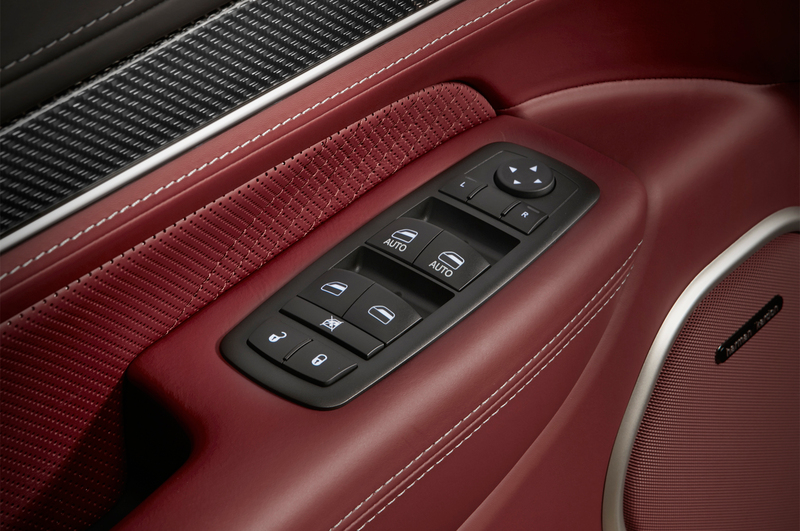 There will be no Ferris Bueller activities here as Valet mode puts the Jeep on complete lock down. 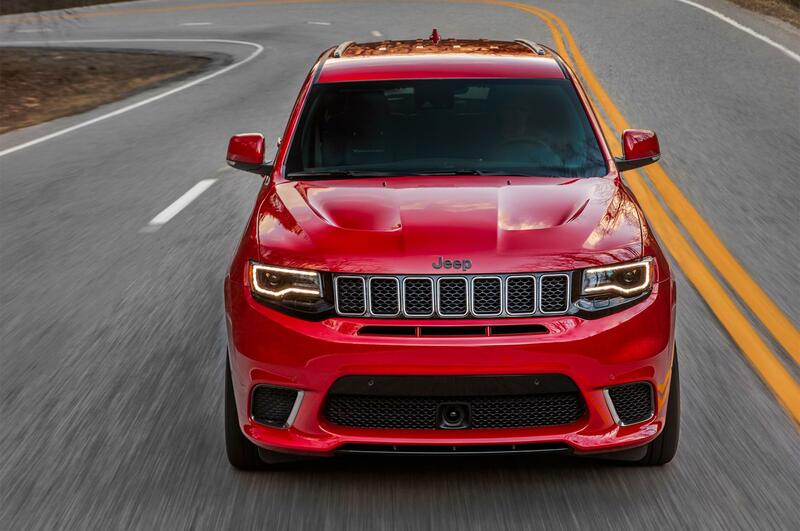 On the exterior, the Grand Cherokee SRT Trackhawk looks almost identical to the SRT. 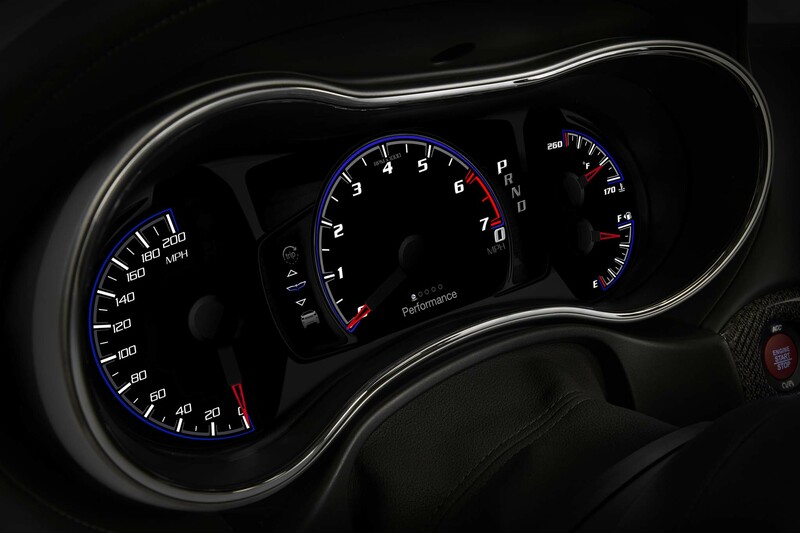 The biggest difference is the fog lights have been deleted and replaced with live air inlets to allow for better engine cooling capabilities. 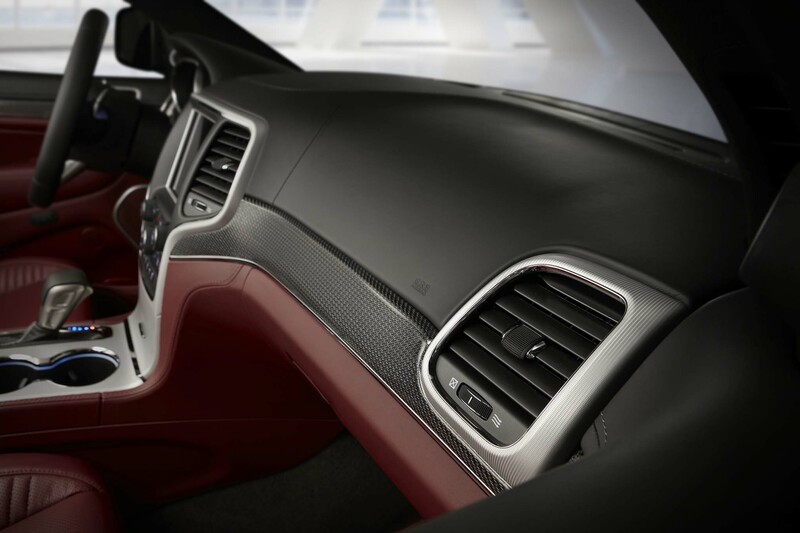 The driver-side inlet feeds cold air into the engine intake where-as the passenger side inlet serves the oil cooler. 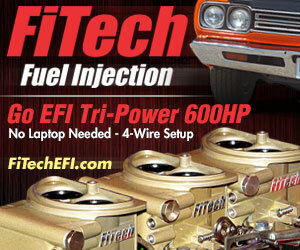 After all, that big supercharger has a maximum air-flow rate of 30,000 liters per minute. 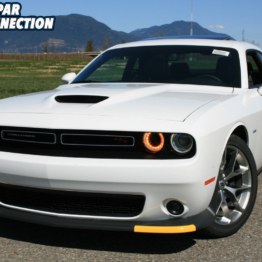 Like the Hellcat, who needs fog lights when you have 707 horsepower? 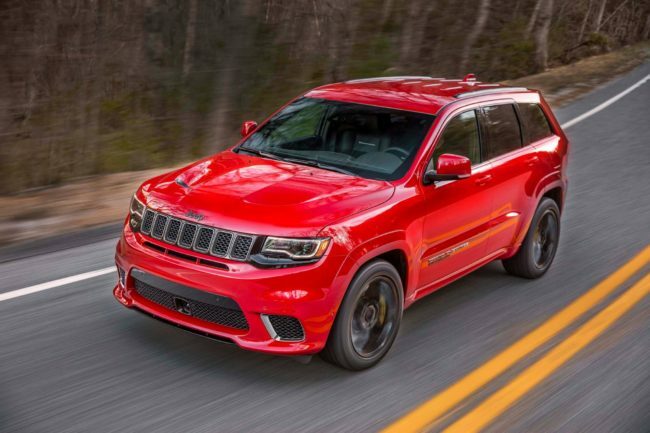 Other small visual exterior differences include “Supercharged” badges on each door and out back; you will find a “Trackhawk” badge on the hatch. To those first generation SRT Jeep owners who love the center exit exhaust from their generation, like the current generation SRT, the Trackhawk will not feature that. 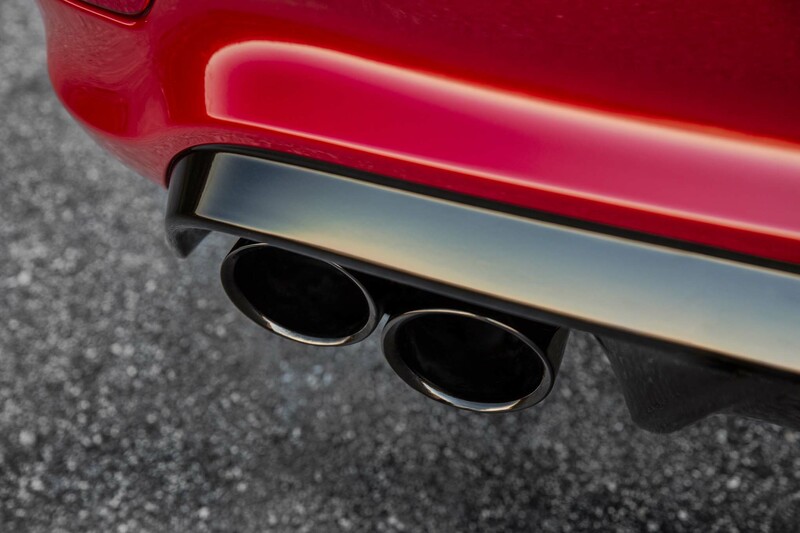 Instead, the single round dual tips have been replaced with black chrome quad exhaust tips. 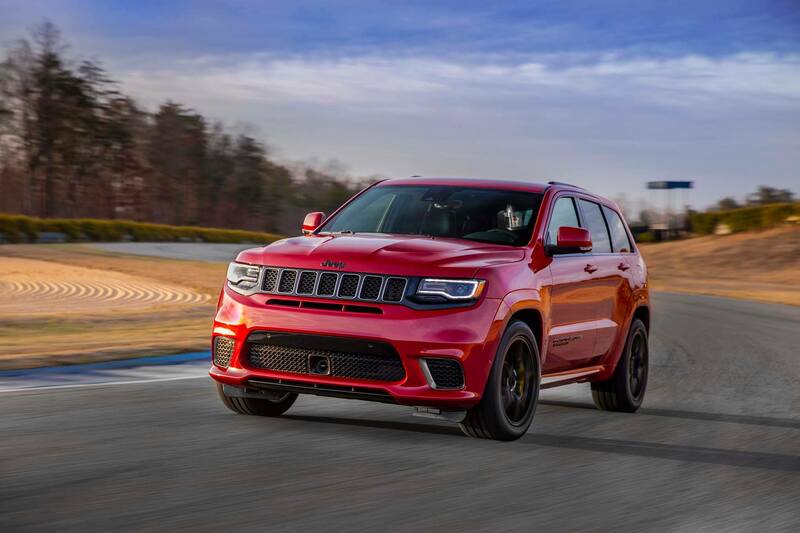 We assume like all other SRT vehicles, all customers who buy a new Trackhawk will receive a one full-day session at the Bob Bondurant School of High Performance Driving in Arizona. 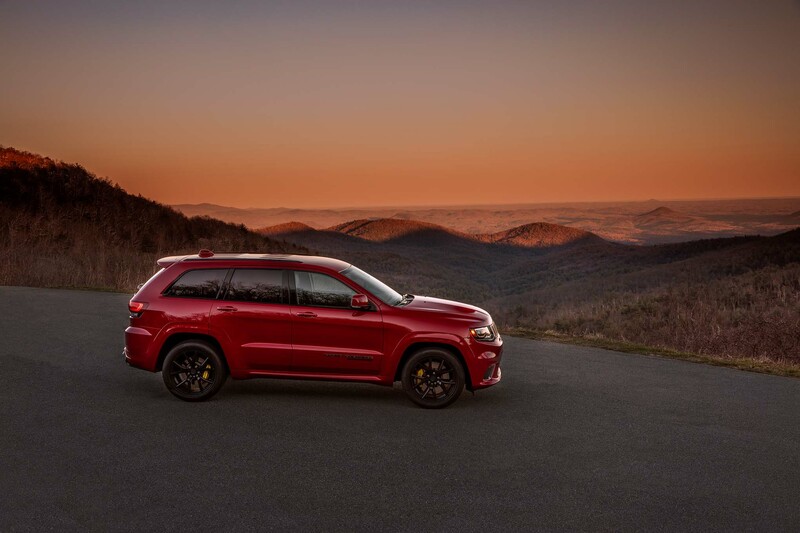 The 2018 Jeep Grand Cherokee SRT Trackhawk will make its official debut at the 2017 New York Auto Show this week and will start arriving in dealerships in the fourth quarter of 2017. 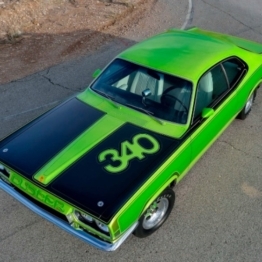 Pricing has not been announced yet but is rumored to be around $85,000 USD.